While North America enjoys their Daylight Saving(s) Time and Europe enjoys their Summer Time, most of the rest of the world does not reset their clocks twice a year – by choice. In fact, some countries and some states within certain countries used to have that annual hour offset, but now have decided not to. Whether by latitude or culture, DST was no longer working for their benefit. Many equatorial countries never adopted DST as they get plenty of sunshine year ’round. 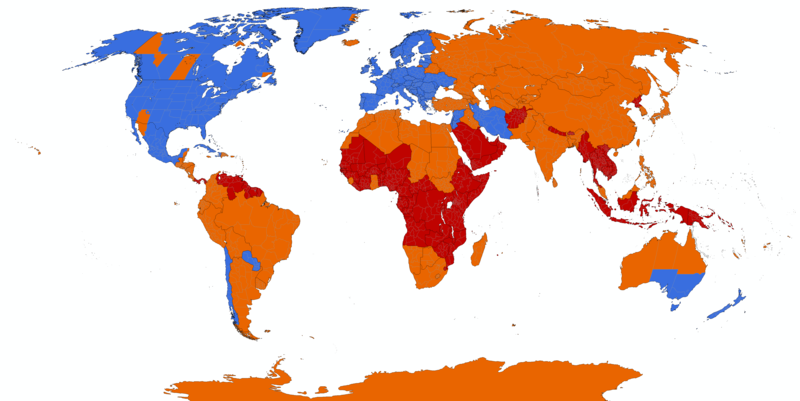 Blue areas observe Daylight Saving Time. Orange areas used to observe it, but don’t anymore. Red areas (mostly equatorial countries) never observed it. Click to enlarge. This is an issue we’ve handled at Masterclock because our clocks are sold worldwide. Our clocks and time keeping devices convert the UTC (Greenwich Mean Time or Universal Coordinated Time) synched signals they receive from GPS satellites and other sources to local time when configured to do so. Whether using Time Code or NTP, users are able to custom configure our clocks with easy-to-use computer apps, so there’s no need to go visit the clocks twice a year to reset them manually. The whole idea, back in Ben Franklin’s day, was to use daylight more wisely since there is so much more of it (in the northern hemisphere) in summer than in winter. 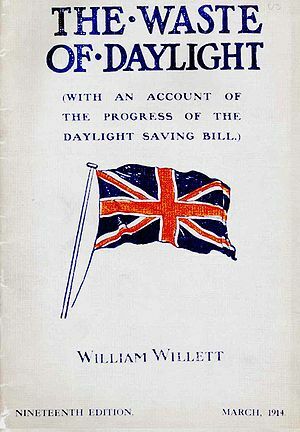 William Willett’s pamphlet of 1914 (at right) was a call to adopt Daylight Savings Time in Great Britain. This came at a time when clocks and watches were synchronizing citizens to the beat of the railroad time schedule that brought about the adption of Time Zones. It wasn’t sunup to sundown anymore. Workers had to be at work on time!Daylight Savings Time doesn’t work for everyone. Farmers still get up with the dawn and stop plowing at dark if their plows are driven by cattle or horses. For those tied to their desks and manufacturing positions, however, having a little extra daylight to enjoy in the summer still seems to work out better, as long as everyone else is on board. Time is important. That’s why we’re in this business. This blog is brought to you by Masterclock, Inc. We design, build and sell a large catalog of professional-quality digital and analog clocks, master clocks, network clocks, time code clocks, time code generators and other synchronized time devices for precise applications at an affordable price. If you have any questions about time, GPS, digital clocks or any other subject you’d like to know more about, sent them to us. We’ll be happy to reply directly and post answers. Come visit us at www.masterclock.com! The New York Times building in New York City, home of one of the most prestigious newspapers in the world. …much of it online and world-wide with the click of a keystroke. Now, even the New York Times is time-stamping certain stories to let readers know exactly when the news was put online, time-stamped again and again as the latest news comes in like clockwork. Our master clock devices are tied into GPS satellites, providing the most exact time on the planet. We’re in broadcasting, power generation, law enforcement and sports. Wherever precise time-stamped documents and stories are produced, we produce the clocks and time generators that get the job done. Even when GPS satellites go offline (during big storms, for instance) our internal oscillators don’t miss a beat.